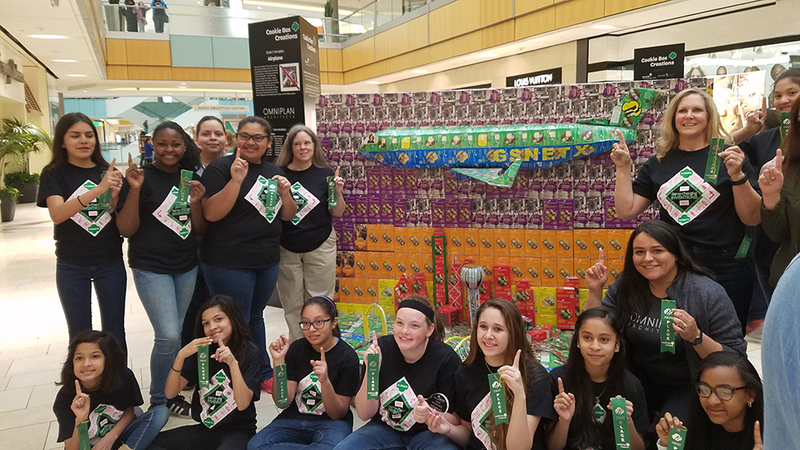 The Cookie Box Creation is a Girl Scout Program that teams groups of middle school to high school age girls with local architects and engineers to turn empty cookie boxes into structures based on a theme. It is also a chance for us to introduce STEM and critical thinking skills to the girls as they strengthen their team-building abilities. We work closely with 6th to 8th graders at Robert T. Hill Middle School, teaching them how to manipulate an ordinary box in to a piece of art. Every year we are impressed with the imagination that comes from the girls. After the initial meeting, we start meeting up with the girls to generate ideas. This year, the girls had the opportunity to visit our office to talk about the topic. We encourage them to think about how the invention of the airplane affects not only their lives personally but their city also. The girls researched famous people like Amelia Earhart and our local airports, Love Field and DFW airport. After synthesizing those ideas, we start sketching over tons of pictures with trace paper. For some of the girls they had never seen trace paper, it wasn’t long before they were easily taking ideas from different photos. The next step is trying to make the sketch into a reality. 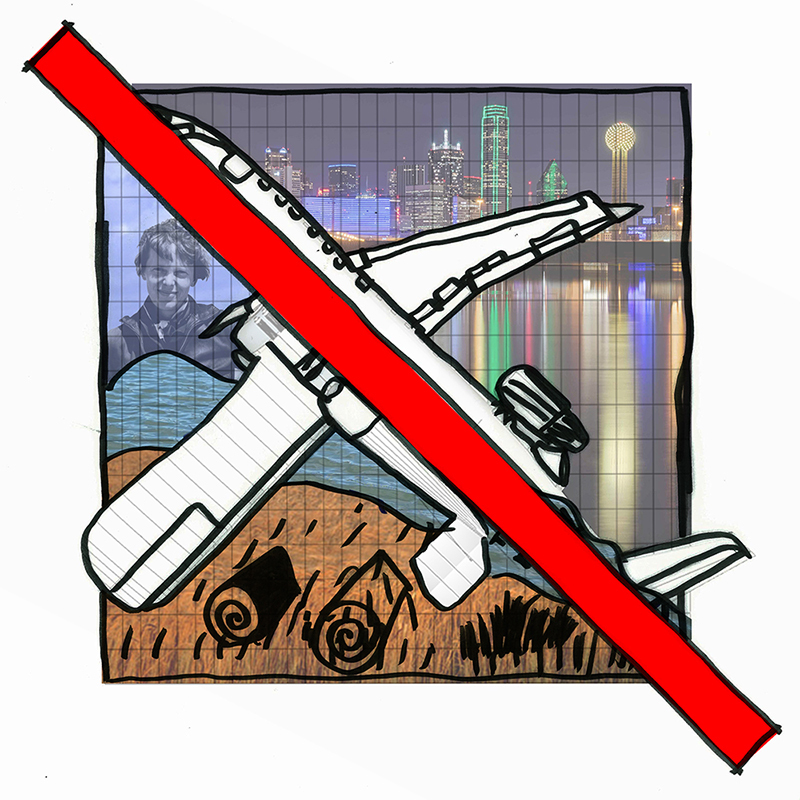 This year, we decided to focus on two airplanes, a modern airplane flying over Dallas’ skyline on one side, and on the other side, Amelia Earhart’s plane flying over her route around the world. We order the number of boxes & try to figure out the internal structure of the design. The most time-consuming part of the executing the design is making this idea into a reality. Often, it includes a lot of taping, folding, scoring & gluing. One of the most rewarding parts of building the structure is seeing the girls work as a team. The eighth graders typically have two years of cookie box creation under their belt. They are the experienced veterans who help the sixth graders with learning how the boxes should come together. Even previous students who have participated in past cookie box creations visit to see how the progress is going. A comradery develops between the girls over time. Now they slowly see their vision grow. Now to the fun part! Every year, the final cookie box creation gets displayed in a public location in Dallas. This year, the structures were on display at the Galleria Dallas. All the middle school girls come, transporting the pieces of the cookie box creation to their designated space and placing the final touches. We are always surprised by how everything comes together. Even though we have been working on it for three months, we have only seen portions of the sculpture. We have only four hours to make the structure whole, starting with a messy fury of activity to a clean and finished piece of art. After the build day, the cookie box creations are on display for three weeks. The visitors of the shopping mall are able to vote for their favorite structure during that time for the “People’s Choice Award.” At the end of the three weeks, all the teams meet again at the Galleria Dallas for the Tear-Down Ceremony. This year, our team had the honor of winning 1st place. The girls screamed from excitement and happily waved their 1st place green ribbons. They quickly celebrated and transported their cookie box creation back to a truck to have their work displayed at the STEM Center of Excellence. First and foremost, we wanted to thank Shelly Thibodaux for leading the girls at Robert T. Hill Middle School. She does so much to bring the girls together, from scheduling meetings, buying craft supplies for the structure, and encouraging the girls daily. We also thank the parents and middle school girls, who have countless hours of time and energy to create the structure. Thanks to Thomas Reprographics for donating large sheets of gator-board for the structure. Thank you to our OMNIPLAN volunteer leaders, Selina Cinecio Falloon, Meredith Quigley, Claudia Brewer, and Emily Teng Yan. Thanks also to our Omniplan volunteers: Martha Schantz, Xavier Encerrado, Jose Zamora, & Amanda Adler.